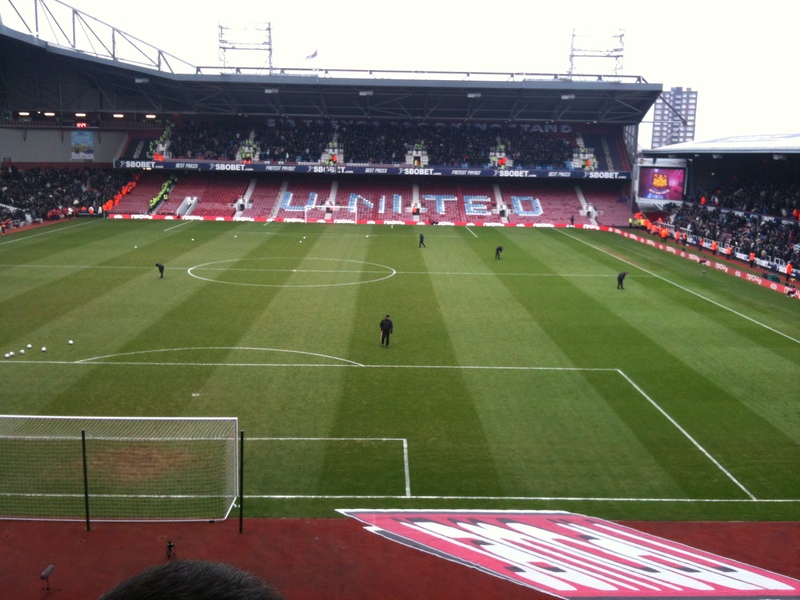 Home > Football, West Ham United FC	> WHUFC vs Millwall 4th Feb 2012. Championship. 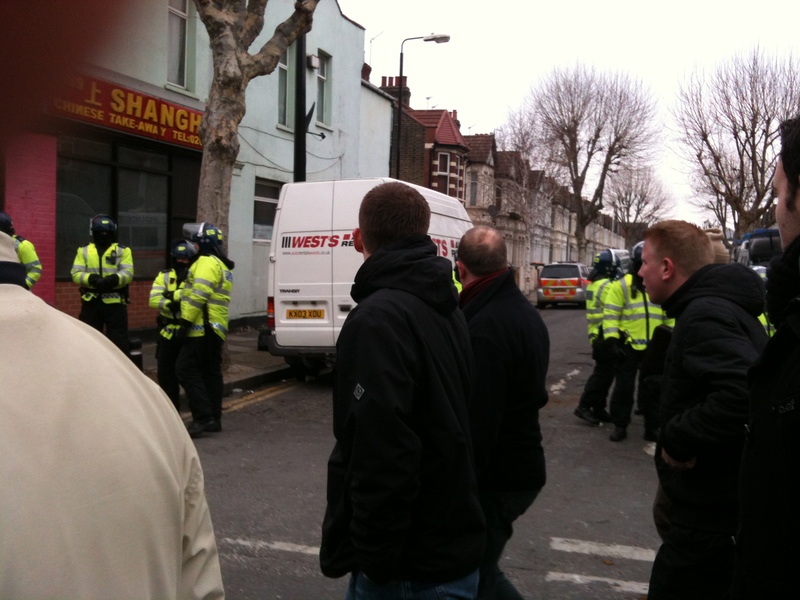 WHUFC vs Millwall 4th Feb 2012. Championship. Apparently, there was some premier league action happening on the same day, but as usual the press and radio have been building up this game into something else. In what is becoming a more regular fixture these days, WHU entertained our near neighbours Millwall, in a match that could determine both their seasons. First off it was my first visit to UP this year, due to work and holidays, so it was long overdue. Also it was an early kick off, which although irritating, sets the rest of the day up well, as long as we get the result. As per usual, it was bloody freezing, but once in the ground the pervading atmosphere warmed things up nicely. As both sets of fans don’t play too well together, Millwall were put into the top tier of the Centinary, with the bottom left empty. I’m sure they didn’t mind as they are well used to half empty stands. The game started at a real local derby pace, with a keen enthusiasm. Too much , in fact, as Kevin Nolan found out after getting a straight red, after 8 mins. To say this put a downer on precedings is an understatment, but in these days of increased analysIs on the two footed tackle, He had to walk. The game then dropped into what is rearly was, a standard issue championship game with one or two highlights. One of these was Mark Noble, who was actually superb throughout. Hopefully the lad is turning the corner that he has been looking at for about 3 years now. About 20 mins in, some 2-300 ticketless Millwall “fans” we’re being escorted up Priory Road, and the usual exchange of “banter” was given and taken. These gimps were then kettled to the park, where hopefully they were kept until at least midnight. CC was getting more and more isolated as you would being up front on your own, and a man down, but battled away trying to get Faubert involved. We started to get on top with about 10 to go in the first half, and a looping header from inside the box from CC made it one nil on the stroke of half time. We started the second half in control, but then started to panic. Instead of clearing lines effectively we were underhitting almost everything. This culminated in Faye making a poor clearance while under pressure from Henderson and gifting Trotter a shot which he put away. This then looked a lock for the draw, except that 2 mins later, the Millwall keeper made a shocking error in punching when he should of been catching, and hit it straight to Reid, who powered a shot into the waiting unoccupied goal. Cheers ! So today, our 2 best playerswhere Noble and Reid. Strange days indeed. To be fair to the whole team, they did put a shift in, being down to 10 men for most of the game. On leaving the ground I had commented to John howwell the Met had done policing the game (still not sure if everyone needs to be in riot gear) when their their usual shorsightedness came to the fore. If I’m walking up Green St, and want to carry on North, I don’t expect to be forced to join the tube station queue, and the when at the entrance to the tube station, shown a gap in the railing about 8 inches wide to go through. I thought crowd management was to stop bottlenecks, not create them. In short we got the hiding from Ipswitch out of the way, and gave our local rivals a loss, which with other results, put us 4 points clear.